Digi Telecommunications (“Digi”) is one of three big telcos in the country to have a midnight ‘launch’ of the new Apple iPhone 5s and iPhone 5c smartphones. The yellow telco is offering the iPhone 5s from as low as RM965 with a iDigi 138 plan, and the iPhone 5c is free with the iDigi 238 plan. Klang Valley – SS2 – No. 24, Jalan SS2/66, 47300Petaling Jaya, Selangor. Johor Bahru – Taman Molek – No. 6 & 8, Jalan Moleh 1/12, Taman Molek, 81100 Johor Bahru, Johor. Kuching – Jalan Kulas Tengah – Lot 506 – 507, Section 6 KTLD, Jalan Kulas Tengah, 93400 Kuching, Sarawak. Kota Kinabalu – Api Api – Lot 5/G3, Ground & First Floor, Api-Api Centre, 88000 Kota Kinabalu, Sabah. Penang – Pulau Tikus – 368-1-02, Jalan Burmah,10350 Pulau Tikus, Penang. Digi made available the iPhone 5c for just RM99 with the Digi 138 plan, limited to 100 units per Digi Store on a first come, first served basis. This applies to the five stores participating in the iPhone Midnight Launch on 31 October 2013 (12.01am – 5.30am). Digi introduced a smart way to virtually queue for the new iPhone devices prior to the launch proper. Called the #DIGIFASTLINE, buyers can ‘queue’ online and can get on the fast track by Facebook sharing and tweeting. 250 spots were allocated, and this concept allowed selected #DIGIFASTLINE winners to get devices first. 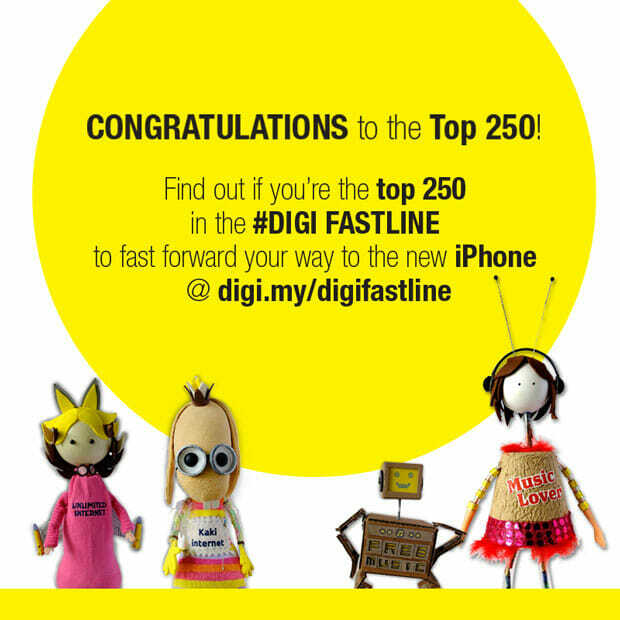 One of the first owners of the iPhone 5s was Jason Ooi, who was also one of 250 #DIGIFASTLINE selected ‘queuejumpers’. What an awesome gesture. Well played, Maxis.